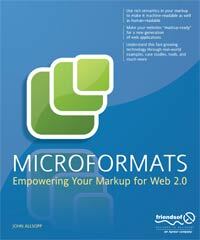 I`ve recieved “Microformats: Empowering Your Markup for Web 2.0” (ISBN 978-1-59059-814-6) a few days ago. I`ve been busy implanting MicroFormats to this website. It`s now possible to import hCard data whenever you`re trying to place a comment. The website is also MicroID enabled. I`ve also added APML support to the website. In addition to the new features I`ve also fixed a caching bug (which was my fault actually). And ofcourse the forum has been working for the last 2 weeks atleast. I`m currently exploring DandyID to replace a bit of the current menu to a half-automatic identity manager.